The 2017 Kia Sorento is an excellent midsize SUV with a wide range of optional features including a powerful V6 engine and third-row seating. In addition, user-friendly entertainment and driving features have led to many reviewers giving this SUV glowing reviews. The standard Sorento seats five in two rows on cloth seating. The front seats have received very high marks for comfort and the second-row seats are comfortable, if slightly more cramped compared to some full-sized SUVs. Third-row seating is an optional feature that can be added for $1490, boosting the total seating to seven people. However, most reviewers agree that the third-row seating is cramped for anyone other than small adults or children making it unsuited for longer trips. The SXL trim offers power folding for the second-row seats, making the cargo space or third-row seating more accessible to the occupants. The Sorento’s cargo space offers 38 cubic feet of storage with the second-row seats in use and 73 cubic feet of storage space with all seats in the folded position. Sorento’s with the optional third-row seating have access to 11.3 cubic feet behind the third row. When compared to earlier models, the most important change in the 2017 Sorento is the addition of Apple CarPlay and Android Auto smartphone integration, making the vehicle more passenger friendly for long excursions. In addition, the 2017 Sorento has a number of newly available safety features, including automatic emergency braking and adaptive headlights. The Kia Sorento is an impressive midsize SUV with an interior that has a number of improvements over the earlier models. There are plenty of storage nooks for passengers to stow small items, while climate and entertainment system controls are easily accessible to the driver and front passenger. The trim is understated and elegant, with soft touch materials placed wherever the occupants are likely to come in contact with them. The 2017 Sorento has two basic powertrain options, a standard 2.4-liter four-cylinder engine generating 185 hp and a 240 hp 2.0-liter turbocharged four-cylinder that is restricted to the Sorento EX. Finally, a 3.3-liter V6 with 290 hp is standard on the SX and SX Limited and optional for the LX and EX. A 6-speed automatic transmission is the only transmission type available for the Sorento. However, all-wheel drive is an option for all models except for the basic L model. Although some reviewers have found the standard engine to be underpowered, others have been satisfied with the power it provides. In this case, it would be wise for prospective buyers to test drive the Sorento in order to get a feel for the engine type that best suits their needs. The Sorento provides an excellent and responsive ride on clear and rainy roads alike. While the AWD system is best for drivers who expect to be facing difficult road conditions, the standard front-wheel drive is not deficient by any means. On the whole, the Sorento provides a driving experience that is competitive with any other SUV in its class. Perhaps most impressively, the basic Sorento’s mileage is 21/28 mpg for city/highway driving, while the AWD V6 comes in at a still impressive 17/23 mpg for city/highway. 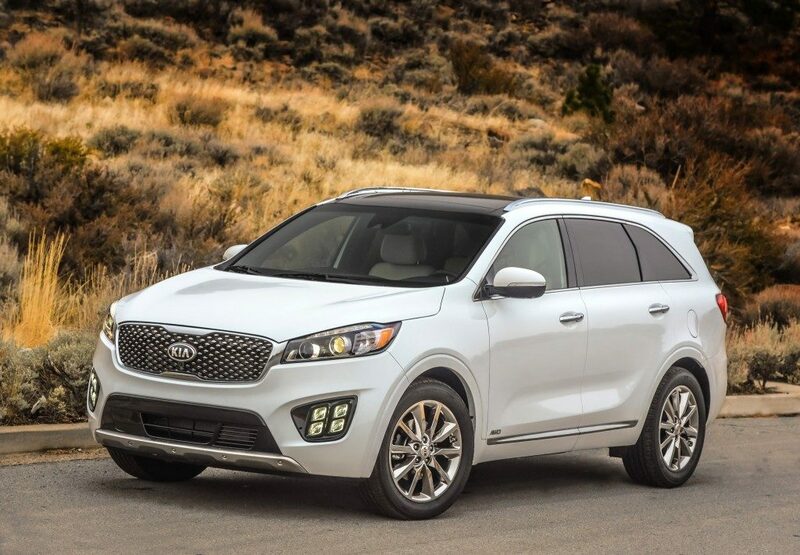 The Sorento compares very favorably with other SUVs in its class for fuel economy and will result in substantial fuel savings, especially for owners who use the Sorento for extensive commuting or pleasure trips. Finally, the Sorento has a surprisingly robust tow capacity. The front-wheel-drive Sorento can tow a maximum of 3,500 pounds, while models with AWD can tow a maximum of 5,000 pounds. This is equal to what some full-sized SUVs can tow; making the Sorento adequate for most loads its owners will need to transport. On the whole, Kia has provided a driver-friendly vehicle in the Sorento. It corners well and is maneuverable enough to fit in on crowded streets, and perhaps most importantly for urban drivers, crowded parking structures. It can handle rough roads, with the added benefit of a well-designed cabin that keeps most noise from disturbing the driver and passengers. Both the Sorento’s brakes and suspension provide a firm sense of connection with the road, making the driving experience still more pleasurable. The basic Kia Sorento is well-designed, with a five-star overall rating from the NHTSA. All models include front active headrests, front seat-mounted side airbags, side curtain airbags along with a rollover sensor, electronic stability control, hill start assist and antilock brakes with electronic brake-force distribution. The LX model includes a standard backup camera, while the SXL includes a 360-degree monitor. The 2017 Sorento is moderately priced, making it an excellent choice for more budget-minded individuals. The basic L trim is priced at $25,400, but its relative dearth of available features makes it likely that most buyers will choose to select an upgraded trim in order to take advantage of the various included and optional features. The Kia Sorento LX, priced at $26,700, includes a number of upgraded features, including a 4.3 touchscreen, two USB ports, and a rearview camera. Available options include an $1,800 Convenience Package, which adds rear parking assist, heated front seats, and a Kia UVO infotainment system with Android Auto as well as Apple CarPlay. Dual-zone automatic climate control and power-adjustable driver’s seat complete the improvements in driver and passenger comfort. Finally, third-row seating can be added for $1490. An Advanced Technology package requires the purchase of the Convenience package and third-row seating, adding $1,500 to the cost of the vehicle in exchange for a number of safety features, including lane departure warning, automatic emergency braking, forward collision detection, and adaptive cruise control. Finally, the LX also comes with the V6 option, retailing for $28,990. The EX starts at $31,500, adding most of the features found in the Sorento LX. A $1,600 Premium package adds a powered liftgate, folding side mirrors, blind spot monitoring and rear cross traffic detection. The Advanced Touring package adds $2,500 to the total cost and includes adaptive cruise control, forward collision warning lane departure warning and a panoramic sunroof. The EX also includes a standard turbocharged four-cylinder engine. Starting at $38,600, the SX is the elite trim for the Sorento. An 8-inch touchscreen, HD radio, 10-speaker Infinity sound system, 14-way power driver’s seat, panoramic sunroof and a smart power liftgate dramatically improves the comfort of this model. The $2,000 Advanced Technology package adds a heated steering wheel, forward collision warning, adaptive cruise control, lane departure warning, automatic emergency braking, high-intensity headlights with automatic cornering, and ventilated front seats. The $43,900 SX Limited V6 trim includes all these options as well as heated second-row seats, a 360-degree monitor and Nappa leather furnishings. With a fuel-efficient engine and a number of useful upgrade options, the Sorento is one of the better offerings on the SUV market. Excellent safety ratings, good mileage and a very comfortable and roomy interior make this an ideal SUV for families and single professionals alike. Finally, the Sorento’s reasonable cost puts all of these features in reach even for budget conscious purchasers. As such, the Sorento should be considered one of the better SUV choices for 2017. Thinking of buying a Kia Sorento? Already own one? Leave a comment and let us know what you think!